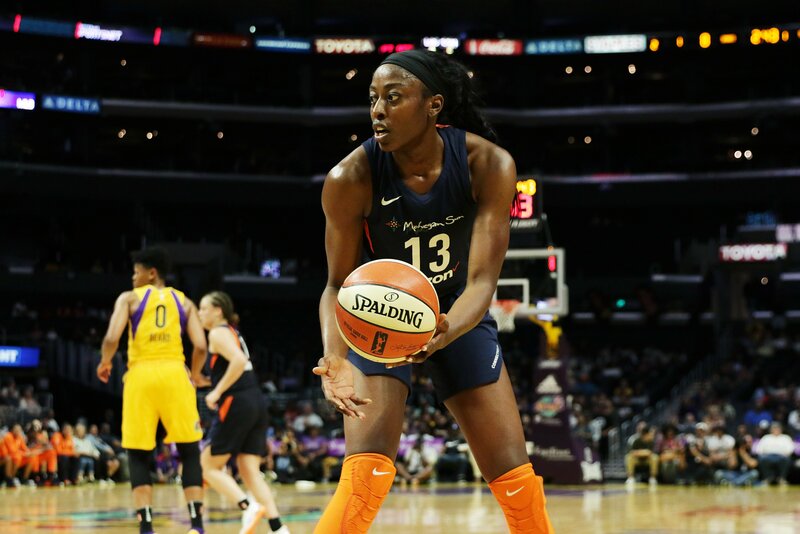 Chiney Ogwumike led the Sun with 21 points. Maria Noble/WomensHoopsWorld. 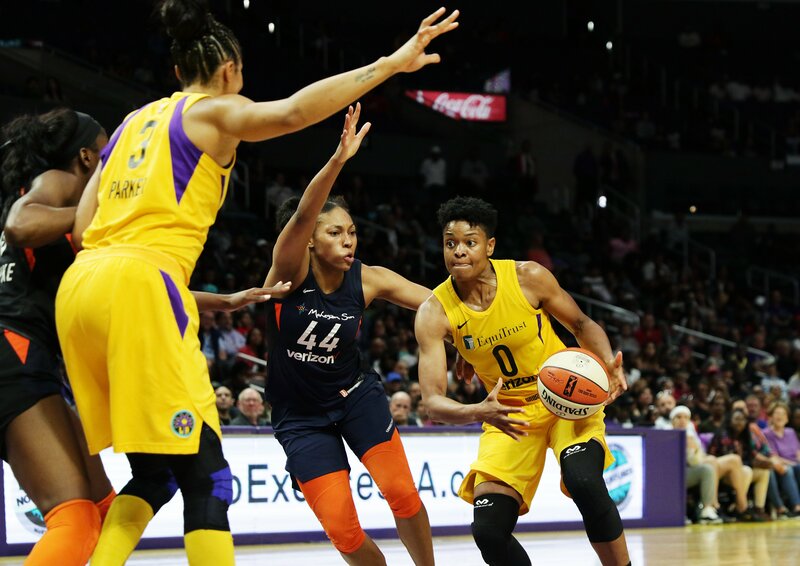 Los Angeles – The Connecticut Sun survived a second half rally by the Los Angeles Sparks Tuesday to close out a needed win and shock the home team, 73-72. 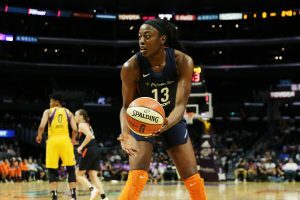 Chiney Ogwumike, who finished with 21 points on 9-14 shooting, scored on a driving layup with 18.5 seconds remaining to give her team the one-point advantage with the fifth of six lead changes in the match up. 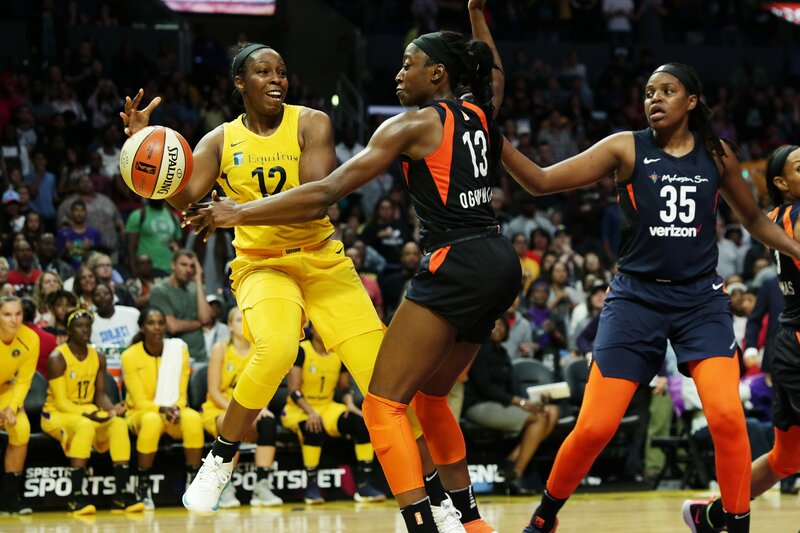 Chelsea Gray lost the ball out of bounds for the Sparks at 3.5 seconds, and Ogwumike’s sister Nneka stole the Sun’s inbound pass for the hosts, but missed a shot from two steps past the mid-court line as the final buzzer sounded. Rachel Banham had 11 points for Connecticut, and Alex Bentley came off the bench for 10. 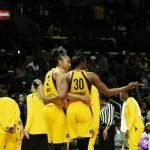 Nneka Ogwumike netted 20 points for Los Angeles, while Candace Parker and Gray added 17 and 12, respectively. 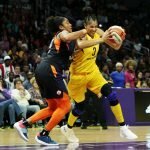 The win was big for the Sun, who started the season 7-1, but have struggled since starting forward Alyssa Thomas has been out with a shoulder injury. They lost four straight games in mid-June as they have adjusted their lineup. 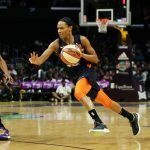 During this road trip they have also been without starting guard Courtney Williams, who didn’t make the trip for personal reasons. But despite the challenges, Connecticut coach Curt Miller said his team went into the game with a different mindset. 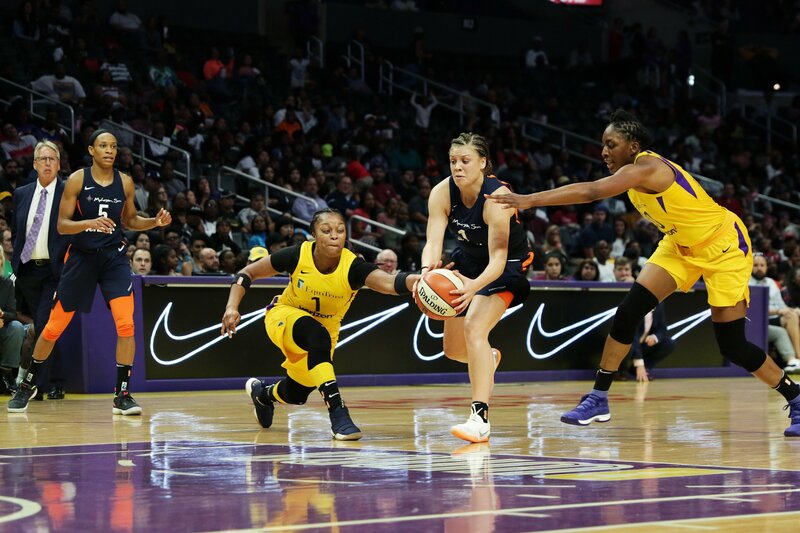 Rachel Banham is defended by Odyssey Sims and Nneka Ogwumike. Maria Noble/WomensHoopsWorld. 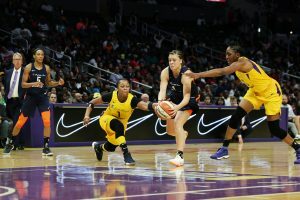 The Sun, which won the previous game match up between the two teams in May, started strong and held the Sparks to just two field goals and eight points in the first quarter. They extended their lead to as much as 20 points in the second period, and took a 16-point advantage into the break. 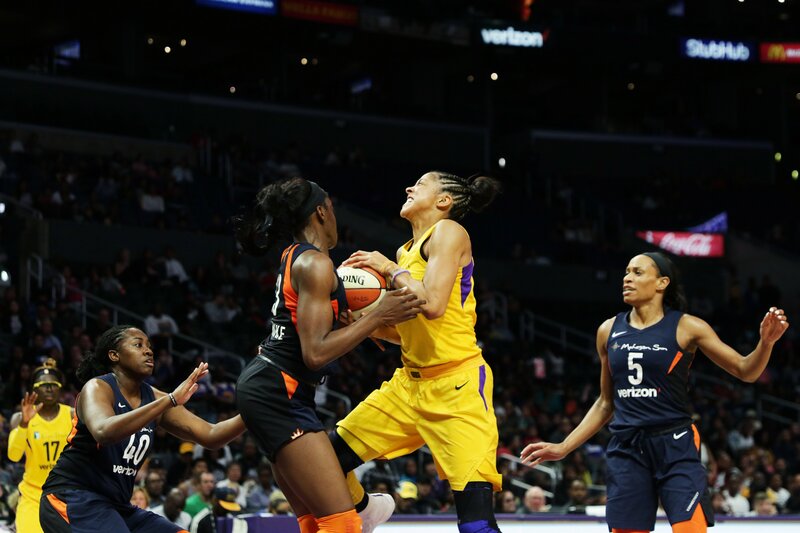 Los Angeles went on a run to begin the third quarter, led by 12 points from Parker, and outscored the visitors, 26-13. The last frame of the match up was a basket-for-basket shootout. Sparks coach Brian Agler said his team’s slow start proved to be too much to overcome. Los Angeles went on a five-game winning streak in mid-June, but since then have lost four of their last seven games. 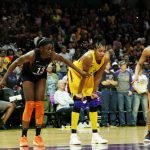 They are now tied with the Phoenix Mercury for second in league standings. 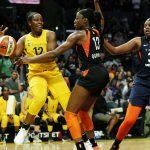 Miller said the parity in the WNBA this season is unlike years past. 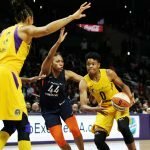 The Sun head to Phoenix to take on the Mercury Thursday, while the Sparks will be in Minnesota the same night to face the Lynx, who also lost Tuesday. Alana Beard looks to attack the paint. Maria Noble/WomensHoopsWorld. 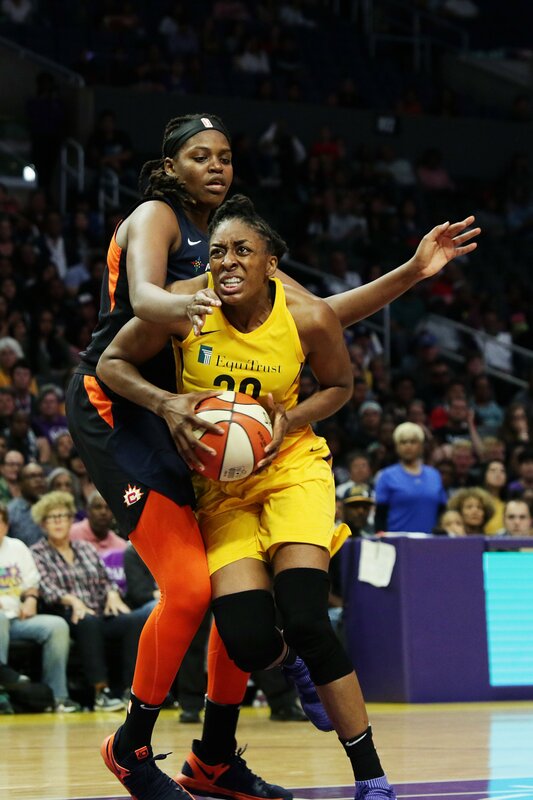 Nneka Ogwumike drives to the basket against Jonquel Jones. Maria Noble/WomensHoopsWorld. 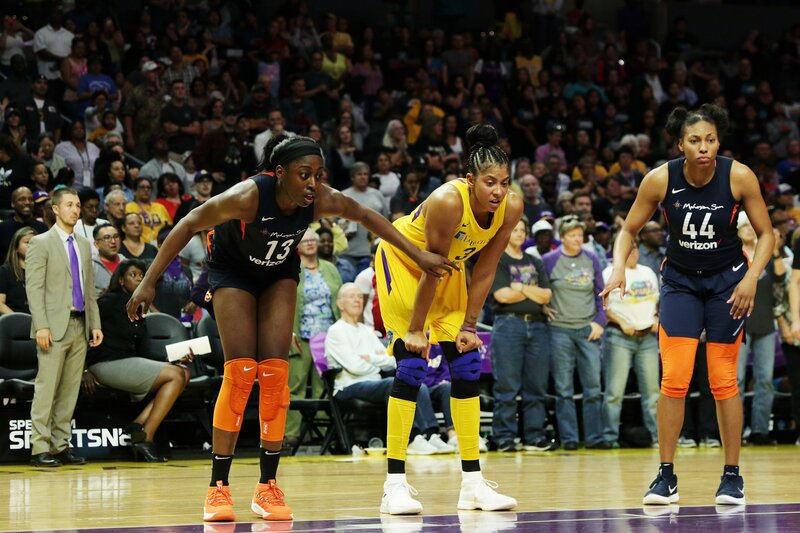 Chiney Ogwumike, Candace Parker and Betnijah Laney line up for a free throw shot. Maria Noble/WomensHoopsWorld. 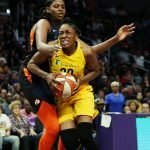 Chelsea Gray tries to retain ball control against Chiney Ogwumike. Maria Noble/WomensHoopsWorld. 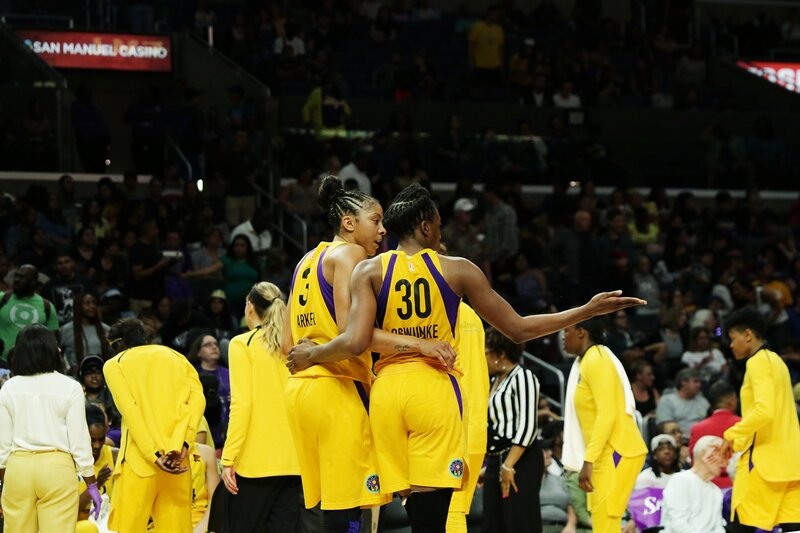 Candace Parker and Nneka Ogwumike confer during a pause in the game. Maria Noble/WomensHoopsWorld. 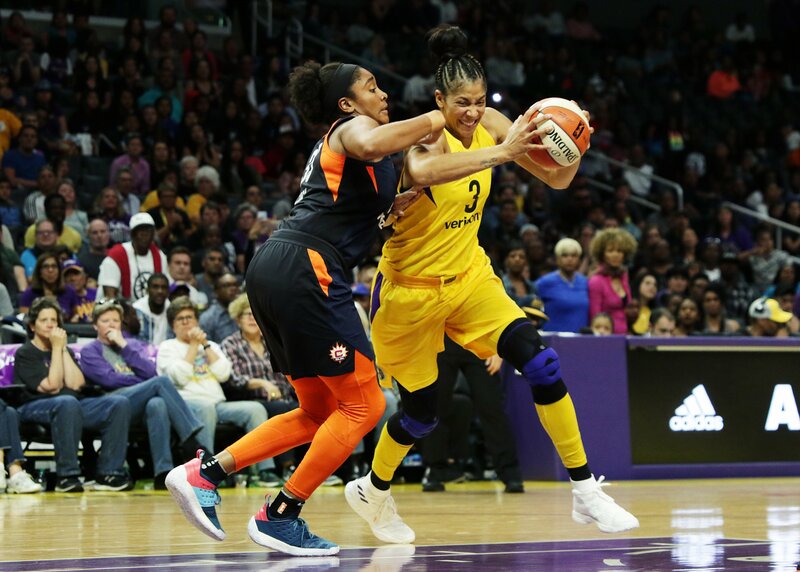 Candace Parker drives against Morgan Tuck. Maria Noble/WomensHoopsWorld. 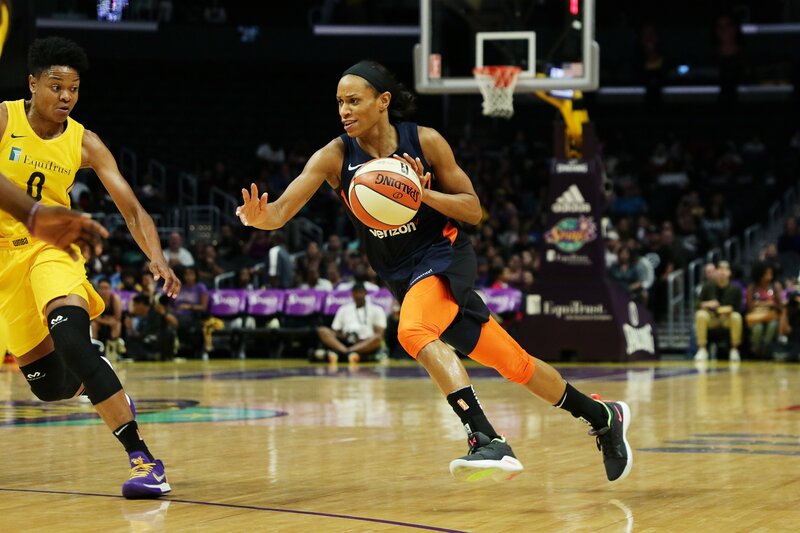 Jasmine Thomas initiates the fast break. Maria Noble/WomensHoopsWorld. 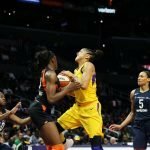 Candace Parker goes up for a shot against Chiney Ogwumike. Maria Noble/WomensHoopsWorld.